Years ago, when I had just transitioning to a vegan lifestyle, I spent most of my time secretly hoping that people would ask me why I was vegan. Like many new vegans, I was all conviction and ardor. I felt like a soldier in a great and important battle, and I welcomed a fight. Over time, the desire to take up arms waned. I found that a lot of conversations about my lifestyle felt not like dialogs, but attacks, and I was less prepared for battle than I thought I was. I was reminded of the fact that verbal debate has always made me painfully uncomfortable; an introvert, I’d always prefer to express my opinions or views in writing than in an argument (staged debates in high school history classes were basically my idea of a nightmare). When debate turns hostile, I feel overwhelmed with a sense of futility, a sadness that two perspectives can’t be respectfully accommodated within the same conversation. So, I started to express my activism in ways that felt more effective and impactful to me than heated exchanges at dinner parties or family gatherings. I started my blog. I brought vegan food to social gatherings in the hope that it would speak for itself. I found online communities of individuals who approached food thoughtfully and were genuinely interested in hearing a variety of perspectives. I found fellow food lovers–the blogging community, and my family of editors and fellow columnists at Food52–who could respect and relate to the desire to approach one’s diet with passion and intention. And I tried to steer clear of arguments that felt hopeless from the get-go. Yesterday, I arrived at an event that I expected to be congenial, a small and casual gathering of people who love food. I was the only vegan there, and much to my surprise, I was immediately questioned about my lifestyle. It had been a while since I’d articulated my veganism in a group of strangers, and I did my best to summon up the explanation I’ve crafted over the years. I tried to speak thoughtfully and gently, in spite of being taken aback that the topic had come up so quickly–and, I thought, aggressively. Little by little, it turned into the kind of exchange I dread, a situation in which questions that were framed as “curiosity” about veganism quickly revealed themselves to be a series of quarrelsome challenges. I stammered my way through it, feeling simultaneously irritated that I’d been caught off guard and also as though I was doing a very, very bad job of explaining myself. I say that I’m always ready to be an ambassador for veganism, but at that moment, I really didn’t want to be. Not just then, not this week. What I wanted was to eat lunch in peace, to find some common ground in a group of new acquaintances. The conversation did ultimately draw to a close, but it put a pall rest of the day. This morning, I spent some time reflecting on it, mostly with the fear that I could have handled it better: did I say the right thing? Was I forceful enough? Too forceful? Did I seem defensive? Did I handle the talking points clumsily? Was my discomfort visible, and if so, did that reflect poorly on veganism? Sometimes criticisms seem unfair, unjustified, or even ill-motivated. All I can think about then is, “What’s best for animals?” It’s not best for animals for me to take criticism personally or return it. The same way you literally get thicker skin; you coarsen it through practice. I try to have a “malice towards none and charity towards all” attitude . . .
There’s a saying I often use which is, “if you walk in the rain you might get wet,” and we choose to walk in the rain every day by being public advocates for animals. If you go out on a limb and become an animal advocate and a face for the movement, you’re going to get criticism, both from people who want to help animals and people who want to harm them. I view myself as a vessel to help animals—that’s really how I view my life. So I’m hoping to hear criticisms in the spirit of wanting to do better and become a more effective advocate for animals. I try not to let it feel personal, but rather just focus on moving the ball forward and recognizing that I’m walking in the rain by choice and I might get wet every once in awhile. I appreciate and agree with what she was saying, which is that in spite of wanting to be ambassadors, we’re also people. Veganism isn’t just an abstract ideal; for many of us, it cuts to the heart of who we are and what we care about most. It’s OK to not always want to dive into conversations that can’t help but feel deeply personal. It’s OK to rest, to sit one out. Yet I take inspiration from Paul’s words. If you choose to identify as vegan, you’ll inevitably be asked to talk about it from time to time. To regard oneself as a vessel of sorts can lend an impartiality and sense of purpose to otherwise difficult and provocative conversations; they become opportunities to give animals a voice, rather than perceived attacks. One may not always get very far; I certainly don’t feel as though I articulated the full scope of my perspective yesterday. Whatever you do say may inevitably feel incomplete or imperfect. 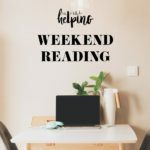 But the challenge is to stick with a scenario in which very different world views are being expressed without being overtaken by hopelessness. It’s an important lesson, and it feels particularly significant to me right now, for reasons that stretch beyond this topic. Yesterday will not go down in history as my finest moment as an activist. But I’m glad that, rather than excusing myself to the bathroom, which is what I wanted to do, I tried to stay calm and did my best to speak up–regardless of how inelegant my words might have been. You can click through to the interview as you check out this week’s links. You might also enjoy my friend Matt’s reflections on 15 years of veganism. Like me, Matt has become less interested in gearing up for a fight as his veganism deepens and progresses. He, too, regards himself as an ambassador for animals, but at this point veganism is just one part of a whole identity that contains many other values and sources of meaning. I can relate. No matter what ideals you hold dear, perhaps you can identify with this process of integration, too. Enjoy the links, and the very tasty recipes. One of my favorite recipes from this blog–and I mean a recipe I make all the time, at least once every month–is my slow cooker masala lentils. 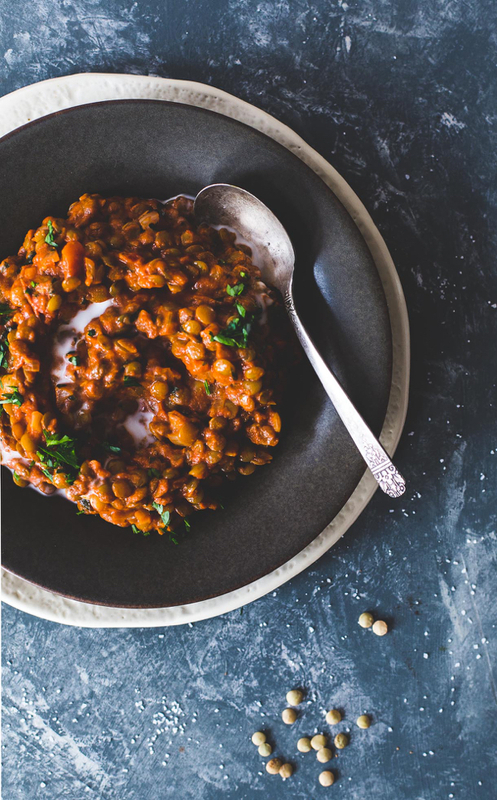 I love the combination of simmered lentils with tomato, and that’s an ingredient pairing that Amanda is paying tribute to beautifully with her smoky tomato lentils cooked in coconut milk. These lentils look incredibly rich and flavorful, and I’m excited to try them. 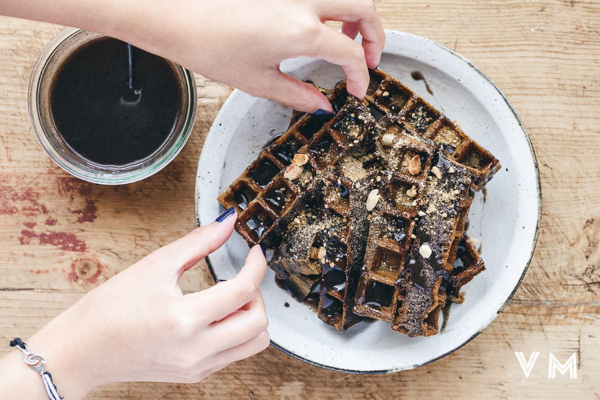 Ever the culinary creative, Rika has come up with an awesome recipe for vegan black sesame waffles. I usually keep black sesame seeds around for sprinkling onto soba noodle salads or rice bowls, and this is a cool new way to use them. 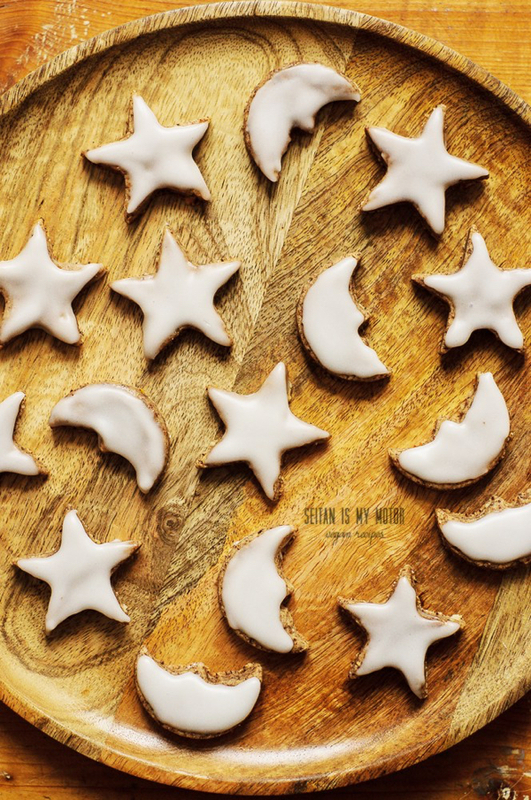 In the mood for a therapeutic baking project? 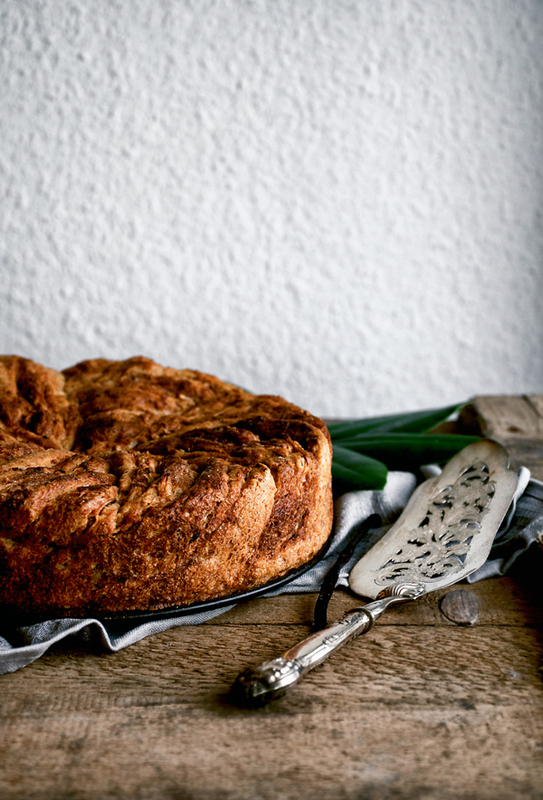 Alexandra’s apple cinnamon bun cake is a very nice place to start (and she has some very comforting words to offer if you’re a little scared of working with yeast breads–which I am!). 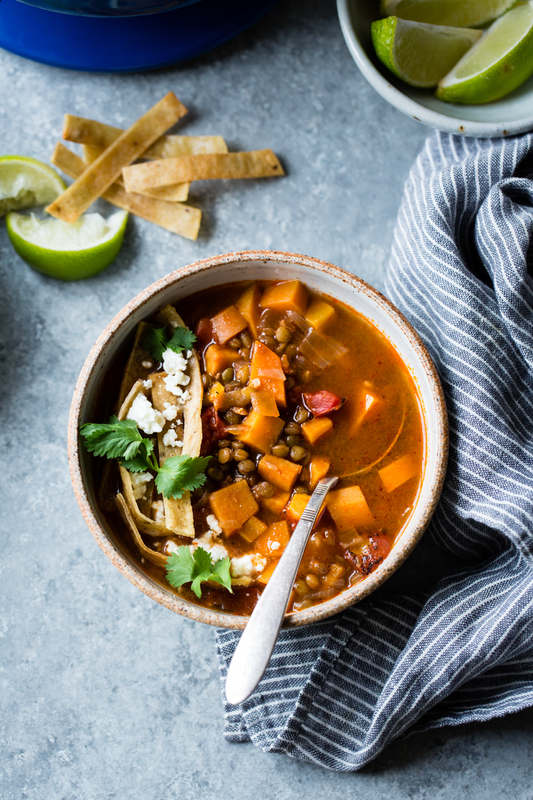 I usually turn to Alanna’s blog for awesomely creative baked goods, but this week I’ve got my eye on her hearty, smoky, sweet potato lentil tortilla soup. Just the thing for a simple, stick-to-your ribs fall supper! 1. Opioid addiction is a growing epidemic in this country, claiming more and more lives with each passing year. Julian Mitton, a primary care doctor in the Boston area, makes a powerful plea for primary care physicians to begin addressing this addiction within their practices. 2. Yet more evidence that focus on weight, dieting, and food restriction is bad for teens and adolescents. It’s time for pediatricians and GPs to shift their language toward healthful lifestyle practices and self care, and away from numbers. 3. As I mentioned, my friend Matt reflects on his fifteen years as a vegan, starting with his impassioned early days and culminating in the conscious, compassionate, rich perspective he embraces now. My story doesn’t exactly parallel Matt’s, but I can certainly relate to a journey in which veganism was at one point the prime thing, maybe the only thing, and over time becomes simply one expression of a broader way of living and looking at the world.
. . . [M]y worldview is expanded from ten years ago. And while my place in the world is bigger than it was because of the opportunities I’ve had, I’m still just one person. There’s only so much I can do. But what I can do is significant: lead by example.
. . . if you are new to veganism and angry about how animals are treated, I’m with you. My advice is to channel that anger into something positive. The positive thing Matt alludes to may be as personal as a lovingly prepared vegan meal, and it may be as public as a piece of writing, a documentary, or a speech. It might be a conversation you have with a family member or friend. It may be a trip to an animal sanctuary, a day spent volunteering with rescued dogs or cats, or the time you take to connect and play with a non-human animal in your life. No matter what it is, cherish it as a means of transmuting grief and frustration into action. 4. My medical nutrition therapy professor, who is a breast cancer survivor and chose to “go flat” after her own double mastectomy, shared this article with us, and I was moved by it. I think it’s important that a variety of options exist for men and women who are undergoing surgery, and I’m glad that the choice to forgo reconstruction is being supported and embraced. 5. Finally, Paul Shapiro’s interview. Whether you’re struggling with activism or simply feeling overwhelmed by the task of interpersonal communication and the quest for mutual understanding, I hope it inspires you. This week: some tasty and wholesome vegan Thanksgiving dishes to savor and share. I’m looking forward to sharing them with all of you! I’ve been following your blog for years. It is a shame that there are still people out there so against not eating meat. I don’t have much point for this comment other then I like your blog and in this day and age I can’t believe (actually I can but am disappointed) that people are still so meat-centric. A thoughtful post as always, Gena. We can’t always be at our articulate best but then again, neither can the antagonists. My Nana always said it is never clever or brave to target a person’s lifestyle choices particularly when they have nothing to do with our own. My Nana is a very smart lady. It is confronting to have to explain a personal choice because it’s…personal. Perhaps if others were more secure in their own choices they wouldn’t need the validation; maybe we can feel compassion for them because of this need. You beat your drum your own way, Gena and that’s all anyone can do. I’ve never commented on your blog Gena, but I have been following it for about five years now. I didn’t realize until now how much I trusted your wisdom, empathy and compassion, but I am deeply disappointed that you did not address the election in this post and only briefly mentioned it in the middle of a recipe post on Wednesday. To see you carry on posting recipes and articles as though everything is the same and our country hasn’t just elected a president endorsed by the KKK makes me very sad. I appreciate that you told a story about the difficulty of discussing hard topics, but to use the example of veganism when this country has so much to discuss in terms of race, class, gender, social justice and basic human rights feels indifferent and uncaring. I remember one of your posts where you discussed how a deep commitment to animal welfare does not have to be mutually exclusive with a deep commitment to other social justice issues, but I am afraid that your choice to focus on food right now when our country has erupted in hateful, discriminatory violence does not demonstrate the commitment to social justice that you have displayed so beautifully in other posts. I wouldn’t expect you to post anything divisive, political or partisan, but there are so many ways to express sadness, fear, and support of marginalized people without dismissing or belittling the folks who voted for our current president-elect. I certainly believe that there will be space to return to discussing food and its power to support community, but I feel that the election must be addressed if we don’t want injustice and hate to become normalized. If you don’t find it necessary to acknowledge what has just happened, then I am afraid it is with great sadness that I will need to stop reading your blog. I’ve just found it’s best to not really mention it and hope no one notices I haven’t eaten anything at the potluck because it’s all meat, cheese and pasta, chips, etc…some times they notice and ask, but most times they are too busy eating their ribs! Ha ha…June..ps. love you’re weekly read/recipes, been collecting them for quite some time now…thx for writing..keep it up! I think that many people are instinctively threatened by veganism because even a moment’s thought about what it means to eat meat in today’s world brings up such disturbing images. For the most part people ignore these, but when they encounter a vegan it’s brought to the fore. Rather than deal with it, they attack. I am not up to fighting that particular battle. When it arises I take the least confrontational approach and tell them that I became vegan because my cholesterol was crazy high and I don’t want to take pills. This happens to be true, but over time it has become a mere partial truth. The cruelty to animals and impact on the environment are important parts of why I remain vegan long after my cholesterol issue has resolved. This approach works to almost immediately dissipate combative attitudes, because it’s pretty hard to argue with a valid medical reason. Sometimes I wish I were more of a warrior, but this path is the one that feels most genuine to me. People aren’t like to be swayed in the midst of confrontation, so it seems a bad time to offer a lot of information. In my rosiest fantasy I think that perhaps someone else with cholesterol issues might consider diet modification rather than supporting Big Pharma. And though I can get away with providing a simple, true, logical reason for what I do, I know it would be far more complicated if I were a blogger and cookbook author. It’s the strangest things that people choose to fight about, isn’t it? I’m always surprised when people are up in arms about things that really have nothing to do with them – why do they care about what you eat? It’s one thing to ask genuine questions, but I’ll never understand why people go out of their way to belittle another person’s choices. Thank you for this beautifully written article, Gena. I have been vegan for 10+ years now . I became vegan first because I thought was such a great idea for health and spiritual reason in my late teens in Japan. During my 20s, I came here and I had so many people asking me why, also there are so many vegans here who are vegan because of animal welfare. Then I started to look for other reasons because I felt like my original reasons were not good enough. Long story short, I do not do that anymore. I think in the end people make these choices for themselves, and things like animal welfare, environment, etc that always come up in ‘why are you vegan?’ talk are definitely motivations, but at the same time, we are vegan because it makes us feel better about it in your own reasoning. Now in my 30s, I still do not like to be attacked with the question but I can just say I do vegan because I think it is a good idea if you can do it.